Kyle during his competition days. “He was a little apprehensive at first, but once he became comfortable at PBK, he just loved it. He thrived with the discipline and became very confident in all areas including the classroom,” said his father, Mark Gallagher. Kyle remembers it similarly. “I was a perfectionist, and shy in everything,” he said. “I took a long time to get comfortable to go on the floor – I might have watched class for almost a month before I first participated. I didn’t want to mess up and look dumb. But then I did, and you could not get me off the mat,” he smiled. 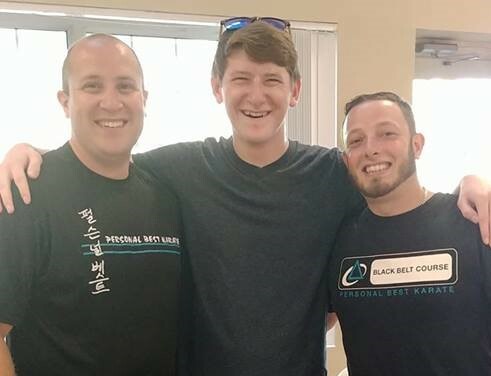 While enjoying his regular karate classes, Kyle’s inner-competitiveness came out and he began to compete on a national team from Rhode Island as well as continue his training at Personal Best. “I started competing when I was 11. But it wasn’t about competing against other people – I liked competing against myself. It was that perfectionist in me,” he revealed. Kyle enrolled at University of Massachusetts in Amherst in in 2014 after graduating from Bishop Feehan High School, majoring in Mechanical Engineering. Utilizing the habits he learned with martial arts and competing nationally helped with classes and internships, especially with a major as demanding as his was. “It was the challenge of the major that interested me. My dad was in engineering, but I also always thought it was an area I could do the most good in,” he said, mentioning that engineering is just about creative problem solving with physics, math and science, his favorite and best subjects. Kyle helped structure the team and performed at local community events, as well as the annual Paw Sox demonstration at McCoy Stadium in front of the crowd of the AAA Minor League Baseball game. This was another center of attention accomplishment that he was able to conquer based on his martial arts training. After graduating from UMass in May of 2018, Kyle’s dreams of making that difference in the world have materialized. He accepted an offer from GE Aviation and will be a Component Design Engineer working on the F404 and F414 jet engines used by many naval jet fighters and the Blue Angles. 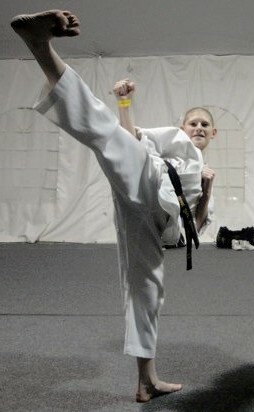 He is excited to start the next journey of his life, pushing the limits on what he will next accomplish – always going back to his karate training at Personal Best.